Firstly, Use the eyelet punch to make holes in the sides of the frame every couple of inches. You want to make at least 4 holes in the side of the frame. For every hole you punch, make sure to punch a parallel hole on the other side of the frame. When you are done punching the holes, install an eyelet in each hole. Make sure they are installed tightly. The eyelets are important since they prevent the wire from digging into the wood. Secondly, hammer one of the 5/8-inch nails into the bottom bar of the frame about halfway through, on one side of the groove. You are going to be using this nail later when you are installing your wire so be careful not to hammer it all the way into the bottom bar. Next hammer a second 5/8-inch nail into the top bar of the frame on the same side as the first nail. Place this second nail right next to the nail holding the frame together. Again this nail will be needed to secure the wire going into your frame so don’t hammer it all the way through. Then start threading your wire through your eyelets on the same side as the two 5/8 inch nails beginning at the bottom. Pass the wire in through the first eyelet, across the frame, and out the matching eyelet on the other side. After, thread the wire into the eyelet directly above the one you just pulled it out from and out the matching eyelet on the other side of the frame. Keep going until you have run the wire through all the eyelets. Take the loose end of the wire and loop it round the 5/8-inch nail that you hammered into the frame earlier. There should be one next to it. Loop it a couple of times and then hammer the nail all the way into the frame. This will secure the wire to the frame. Snap off the excess wire by swinging it back and forth till it breaks off. Pull the wire tight through the frame and secure it by looping it around the other 5/8-inch nail at that end of the frame. Cut the wire with the pliers and make sure that the wire is as tight as possible throughout the frame. Unloop the wire, pull the wires as tight as you can and loop it tightly around the nail. Using the pliers, twist the wire around the nail by turning the nail. The wire should get tighter as the nail twists. Test it by strumming it like a guitar, if it makes a ponging sound then it is perfect. Hammer the nail all the way through the frame and that’s it. That’s it, your beehive frame has been wired. There are plenty of different types of beehive frame wires out there to choose from. Picking the one that’s right for you will depend upon factors like your budget and your level of beekeeping experience. Here are a few of the best ones on the market today. 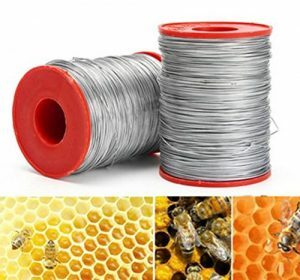 The Nuolux wire for beehive frames weighs 500g and measures 0.5mm in diameter. It is made from stainless steel and plastic. Threading wire through the beehive frame helps to guide the bees when they build their honey comb. It also supports the embossed wax foundations that most beekeepers use to help prepare the frames for the bees to start making honey or for the queen to lay eggs. This beehive frame wire is a bit thin and might sometimes break under pressure so be sure to handle it with care. It is capable of withstanding heat and you will be able to easily melt your embossed wax onto it. The wire does not rust so your honey will be safe from rust contamination. 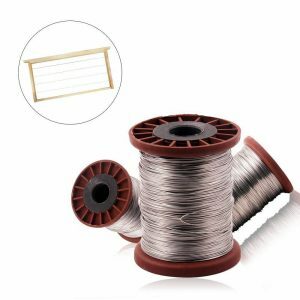 Despite its thinness, this wire can be used more than once. An old brood super with this wire can be recycled. The old wax must be cut away and the wire needs to be heated up. Then the embossed wax must be melted onto the wire. Once the wire cools down you can then place it back into the hive as a honey or brood super. The TooGoo beehive frame wire measures 0.5mm in diameter and weighs 500g. It is made of stainless steel and is strong enough to withstand many wax heating cycles. A wax heating cycle is when the wire is heated up so that the embossed wax base can be melted onto it to create a strong honey or brood comb foundation. After the honey has been harvested from the frame, the wax foundations can be cut away. The wire can now be reheated and more wax can be melted onto it to make new honey combs for the next cycle of honey supers. 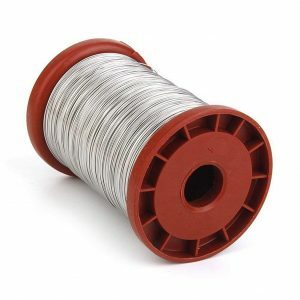 You can also use this wire to make brood combs as needed. The TooGoo frame wire is resistant to rust and provides the beehive frame with stability and strength. This prevents the honey comb from sagging inside the hive when the weather is hot. The TooGoo beehive frame wire is also resistant to rust and corrosion so you don’t have to worry about your honey getting contaminated by rust. The Hestio beehive frame wire is 0.5mm in diameter. It weighs 500g and is made from stainless steel. This wire is strong and can be heated so that wax can be melted onto it for making secure honey comb and brood comb foundations. It is strong enough to withstand being heated over and over and durable enough to last after many years of use. The Hestio beehive frame wire is rust resistant and can be used more than once. Simply cut the honey comb off the frame when it is time to harvest the honey. You can then melt some more wax onto it or place it into the hive as is and let the bees make their own honey or brood comb. Just like the embossed wax, the beeswax will lie flat and will not bow or sag. The wire will also act as a guide so that the bees can build their natural comb along them, making them as straight as possible. If you use a honey extractor to harvest your honey then there is no need to cut out the wax. Just leave the frames out for a few hours to allow the bees to pick the frames clean. Then place them back into the hive as a brood or honey frame. The Sodial beehive frame wire is made from stainless steel. It is 0.5mm in diameter and weighs 500g. It can withstand heating for more than one wax heating cycle. Stainless steel is a durable, light weight material that can withstand both hot and cold. The Sodial beehive frame wire provides strength and stability to the beehive frame. The frames will not bow or sag while in the hive even if it is hot out. It also keeps the wax flat on the frame so that the frames fit properly inside the hive. It is rust and corrosion resistant which means that your honey will be safe from contamination. 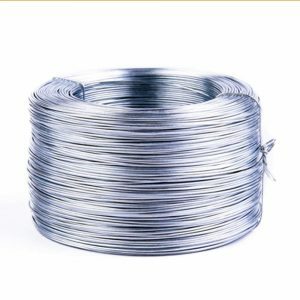 The Advanced beehive frame foundation wire is made with stainless steel. It has a diameter of 0.5mm and a weight of 500g. It is strong enough that you can heat it up and melt embossed wax onto it to form strong honey comb foundations that will not bow or sag while inside the hive. Its stainless steel construction ensures that it will last through being heated up many times over. Stainless steel is resistant to rust and corrosion. It is also very durable. This means that if you wire a frame with this wire it is likely to last a very long time. 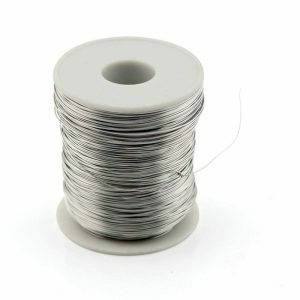 The INNI beehive frame wire is made from 304 stainless steel which is food safe. Stainless steel is a very durable yet lightweight material. It can stand up to heat and cold and it does not rust, so there is no chance of rust contaminating the honey. The INNI beehive frame wire weighs 500g and measures 0.55m in diameter. It is durable so it can survive as many wax heating cycles as needed. The wired frame may be used without the wax to provide the bees with a subtle yet necessary guideline for making their own honey or brood com. Just like the embossed wax, the bee’s natural wax will lie flat on the frame and will not bow or sag in the hive during the hot summer months. The RongZhan beehive frame wire is made of galvanized iron. Galvanised iron is iron that has been coated with zinc to prevent rust. This is a good thing since there is no chance of the honey would be contaminated by rust or corrosion. This material is strong and durable. It can be used for more than one wax heating cycle. The RongZhan beehive frame wire comes in rolls of 267m. The roll has enough to wire at least 60 frames and weighs 500g. 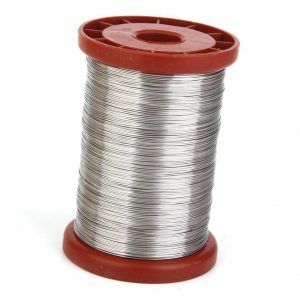 The galvanized iron wire is just as strong and durable as regular stainless steel wire. The difference between the two is simply the cost of production. Stainless steel is much more expensive to produce than galvanized iron yet their attributes are very similar. This means that frames wired with galvanise iron have a very long shelf life. Wax may be melted onto it, cut away and melted on again without weakening the wires or the frame. Like stainless steel wires, the galvanised iron wires also help the bees wax flat on the frame so that all the frames fit properly in the hive. Comb built onto this kind of wire, be it honey or brood, will not bow during hot months. These combs may be used for any purpose the beekeeper deems fit. Old brood comb can be cut away and fresh wax can be melted on to the wire to use as honey comb. Likewise, honeycombs can be left out for a few days so that the bees can eat all the tiny bits of honey left over after extraction. The frames can then be used as brood comb in any one of your brood supers. 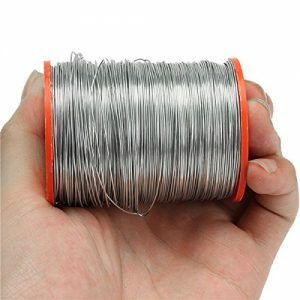 This beehive frame wire has a diameter of 0.55mm and weighs 500g. It is made from stainless steel which is a strong and durable material. It can be used to add embossed wax foundations to your beehive frames. To add wax to a frame, you need to melt the wax onto the frame wire. The Weichuan beehive frame wire is strong enough that you can use a DC power supply to heat it up in order to melt the wax onto it. This makes the honey comb foundations more secure. It also helps to keep the wax flat and prevents bowing while the frame is in the hive, especially during the hot summer months. You don’t always have to add wax foundations to your beehive frame however. You can simply place the wired frame into your hive and allow the bees to use the wire as a guide to make their own honey comb naturally. 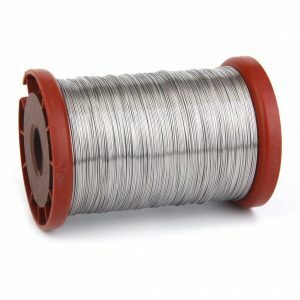 Another advantage to having frame wire made of stainless steel is that it is resistant to rust. There is no need to worry about rust contaminating the honey. Frames with this wire attached to them can be used more than once. When it is time to harvest the honey, the frames can be drained and cleaned of all honey. Then they can be placed into new hives for other bees to use. 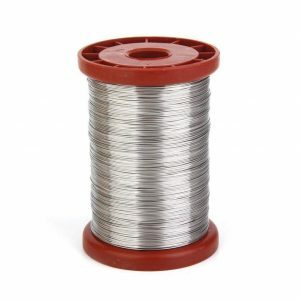 This wire can be used on both your honey and brood frames. The Owfeel frame wire for beehive wax foundations is 0.5mm and weighs about 500g. It is made from stainless steel which all but ensures its durability. Its stainless steel construction means that it can be heated so that the beekeeper can melt embossed wax onto it to create honey and brood comb foundations. Stainless steel is resistant to rust and corrosion. This means that the wire will not rust and contaminate your honey. Frames fitted with this wire will last a very long time and can be used over and over. They can withstand many wax heating cycles without falling apart. With the Owfeel Stainless steel frame wire fitted onto your beehive frame, the beekeeper does not necessarily need to melt wax onto the frame. If you don’t mind waiting a few more weeks to harvest your honey, you can place the frame inside the hive with only the wires and allow the bees to create their own brood and honey comb. The wire will act as a foundation for the bees to build upon. It will ensure that the wax lies flat and is strong enough that it does not bow once inside the hive. This is a problem especially during the hot months in the summer. Fitting the beehive frame with wire will also increase the longevity of the comb built upon it. Essentially it means that the beekeeper will be able to use the frames more than once. The F.A.M.E. 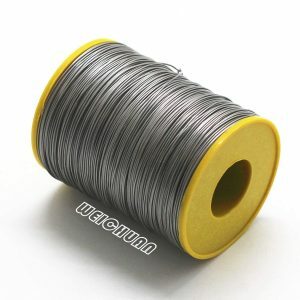 beehive frame wire is made of stainless steel and measures 0.5mm. It has a weight of 500g and is resistant to corrosion and rust. The wire is strong and durable, and can stand up to as many wax heating cycles as needed. You can either melt embossed wax onto it or you place the frame into the hive with only the wire and let the bees create their own honey comb. The F.A.M.E. beehive frame wire will add stability and support to your honey or brood combs. It will ensure that the comb lies flat on the frame and that it does not bow when the inside of the hive gets too hot. Knowing how to wire a beehive frame is essential when first setting up your beehive. Any of the listed beehive frames above will do the job quite well. Do you own any of the beehive frame wires on this list? Which frame wire(s) do you think should be added to this list? Leave a comment below and let us know.